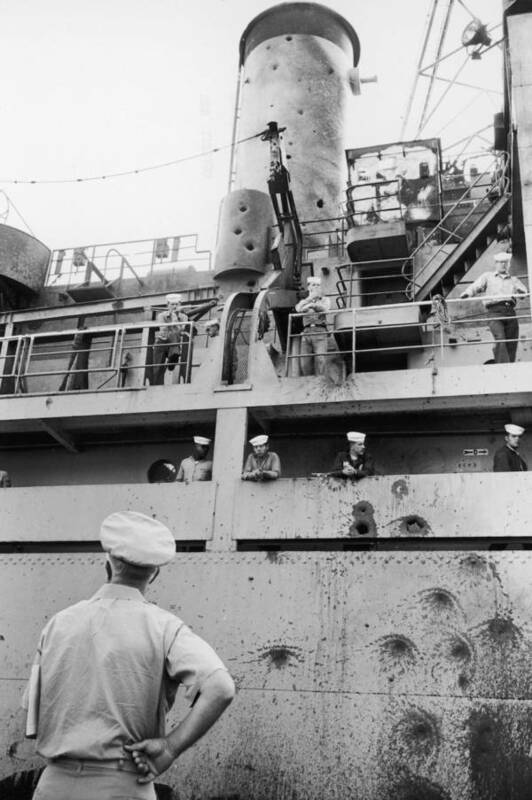 Assistance hovers over the damaged USS Liberty after the attack. It was June 8, 1967 when the U.S. Navy research ship, the U.S.S Liberty, was attacked by the Israeli Air Force and Navy. The unforeseen carnage resulted in some 200 deaths and injuries to American sailors. The incident has been shrouded in grim mystery. It’s believed that a federal coverup was established following the incident and for more than 50 years, classified documents and strict gag orders had been placed on the surviving crew members. Consequently, a debate has continued to simmer over the past half-century as to whether the attack on the U.S.S. Liberty was actually deliberate. To many, the answer to that debate is a dismal yes. It was early June in the 1967 Summer of Love when a barrage of peace-seeking teens and hippies descended upon San Francisco’s Haight Ashbury neighborhood in a bid of anti-war protest and beginning an alternative lifestyle. At the same time the American youth sought peace, turmoil enveloped the Eastern Mediterranean and the Middle East. A Six-Day War was waged between Israel and its bordering Arab nations of Egypt, Jordan, and Syria. The U.S.S Liberty, an American Navy technical research and intelligence ship, was subsequently launched to collect information regarding the progress of this war thus far. Not wanting to turn a local war into a battle between superpowers, The U.S maintained a neutral stance on the conflict. As such, the Liberty was lightly armed as it was meant only to gather information. This, unfortunately, meant that the ship was also vulnerable. On the third day of the Six-Day War, the Israeli Defense Forces (IDF) spied the Liberty sailing in the international waters of the Sinai Peninsula. Over the course of three hours, the IDF sent out eight reconnaissance planes to identify the ship. The U.S.S. Liberty was reportedly flying a large American Flag and was thus easily recognizable as a U.S. ship. But then, Israeli Mirage III fighters, armed with rockets and machine guns, descended upon the Liberty. Napalm and rockets were launched. The deck of the American spy ship was aflame. Though the crew attempted to radio for assistance, they found their frequencies jammed. Though they would eventually radio a successful distress signal to the U.S. carrier Saratoga, the boat never came to their rescue, and this was not even before they could escape another attack from below. Between three Israeli attack boats, two torpedoes were launched at the ablaze ship. One torpedo managed to tear a 40-foot wide hole in the hull and flood the lower compartments which then killed more than a dozen sailors. In an attempt to flee the sinking and burning ship, American soldiers deployed rafts, but these were swiftly gunned down by IDF planes from above. The crew of the U.S.S. Liberty refused their assistance. Thirty-four crew members were killed and 171 were wounded. 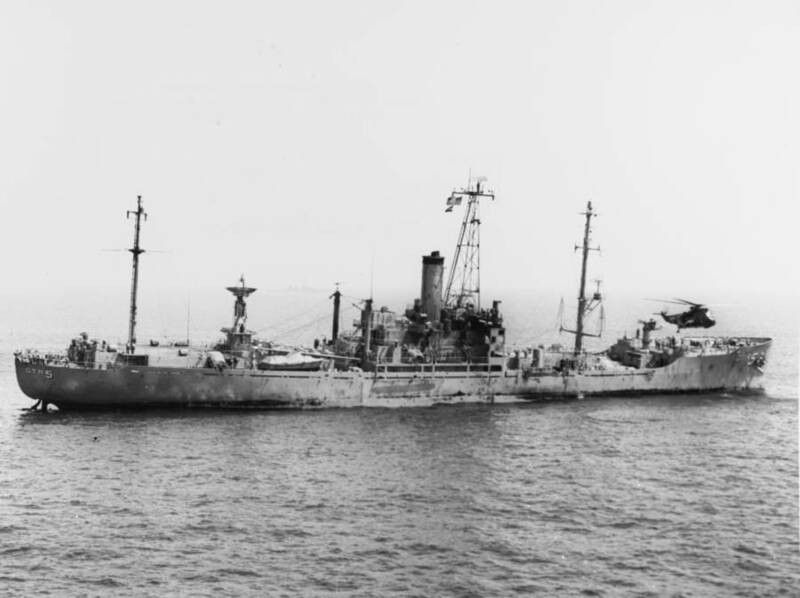 USS Liberty ship after the attack on June 8, 1967. In the aftermath of the tragedy, both governments conducted investigations into the incident and concluded that the attack was indeed a mistake. “These errors do occur,” then-Defense Secretary Robert McNamara reported. The official explanation for the grisly attack states that Israeli pilots and Israeli forces mistook the U.S.S Liberty for an Egyptian freighter. Israel reportedly apologized and offered $6.9 million in compensation. The report goes on to explain how after two hours of the start of the attack, the mistake had been realized, and Israel informed the U.S. embassy that they had attacked the U.S. ship. But the investigation has since been hailed “hasty and seriously flawed” by undisclosed documents which were released in 2006. Indeed, some of the U.S. crew members who were present for the attack refused to accept the official explanation as well. They formed The Liberty Veterans Association and they appealed to the Secretary of State at the time, Dean Rusk, and to then-President Lyndon B. Johnson’s intelligence advisor Clark Clifford, that the explanation was insufficient and reeked of conspiracy. Assult on Liberty, a 2007 personal account of the event from officer James Ennes Jr., blows the whistle on the U.S. and Israel-backed report. He recalls in his account that after a list of killed and wounded was sent to the Bureau of Naval Personnel, the sinking ship received a damning message in return. A victim of the U.S.S. 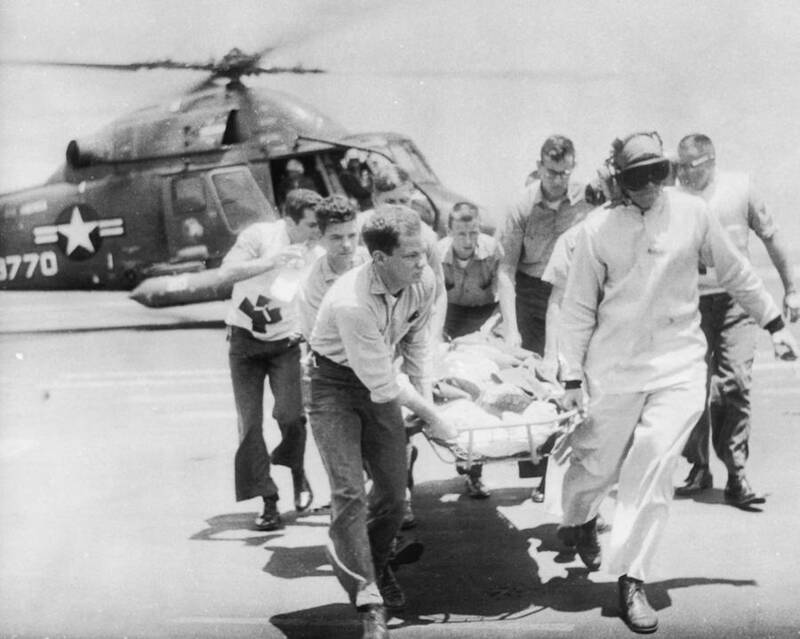 Liberty attack being carried from a helicopter, June 9, 1967. The U.S. sailors’ own Navy had not come to their assistance and in fact, had undermined their misfortune. Gag orders were also issued to survivors of the U.S.S Liberty. This stimulated the theory that the attack was indeed deliberate so that Israel could conceal its seizing of the Golan Heights, which happened the day after. But even more troubling is the thought that Israel had not acted alone. The theory goes on to insinuate that Lyndon B. Johnson, who was president at the time, was behind the attack. The theory explains that this was an attempt to blame Egyptian President Gamal Abdel Nasser as an excuse for the United States to join the Six-Day War alongside the Israeli forces. But further information, even amongst the undisclosed documents, is limited. The survivors have suffered despite reparations, both mentally and emotionally. They continue to wait for the truth about the attack on the U.S.S. Libertywhich nearly ended their lives, and that did end the lives of their companions. Not a mystery. The Israeli's did it. End of discussion. Well yes they did BUT they did it with the fully PERMISSION and approval of LBJ. After viewing the endless facts we have on the USS Liberty no other conclusion is possible IMO. LBJ besides being a notorious murderer was also a traitor who ORDERED numerous of his underlings to share in his treason. Just like the 'accident' on 911 when Israelis were arrested in New York driving a moving van full of explosives! And the other 'accident' that day when 5 Israels were seen with cameras set up on the North Tower BEFORE the first plane hit and were later arrested. Israel only has one real friend, Israel. A whitewash of this cold blooded murder, done by Israel, planned by Israel and the US government together. The Liberty was supposed to sink, but it survived to tell the tale - which the US government did it's best to bury.